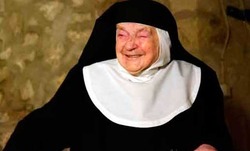 A nun dies at 105 years old. Likely to be the oldest. She was the nun of 10 popes. At 19 years old Sister Teresita made the decision to be a Cistercian nun in the Monastery of Buenafuente. That was 1927. She once said that “even if I had married a prince, I would not be happier than I am now,” to the Correo. We can be grateful for Sister’s perseverance in the monastic way of life. Moreover, her joy seems to have been overflowing. May Our Lady, Mother of the Cistercians with Saints Benedict and Bernard lead Sister Teresita to the Lord. 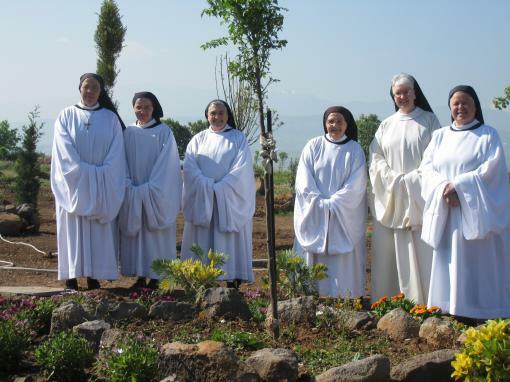 The mostly Italian group of Trappistine nuns forming a monastic colony in Syria are not moving, even in the face of violence. Since 2005, Mother Marta Luisa Fagnani and the other nuns have committed themselves to prayer and work in a country in crisis. Their witness at the Monastery of Blessed Mary of Font of Peace (in Arabic, Dier al Adrha Yanbu’a-s-Salam), is a foundation of the Valserena Monastery in Guardistallo, Italy. They write a blog, Ora pro Siria, in Italian and not frequently updated, but you can get a sense of their witness there. BUT, the monastic project of the nuns is explained here, which also asks the reader to help with prayer, friendship and money. Yesterday, the daily Il Sussidiario published an English translation of an interview with one of the nuns. Two years ago today, Traces magazine published a story, “The Sisters of Syria,” where the nuns talk about their call to make a monastic foundation in Syria, what freedom, the Encounter with the Lord and others and silence means. Few know, for example, that the Middle East had 11 monasteries of the Order of Cistercians of the Strict Observance (the Trappists) but dissolved due to the Islamic invasion. This is something to think and pray about. Do you have the same commitment to the Lord and to missionary zeal as these nuns? The Cistercians of the Strict Observance –the Trappists– are busy reviving monastic life in Norway after an absence since a fire destroyed the ancient monastery. Monks and nuns are taking up with great seriousness the invitation of the Pope Benedict XVI to share the spiritual, intellectual and cultural traditions of the monastic Rule in places where the need is great even new: to bring a light to darkness. Cistercian monks and nuns, hence, are founding separate monasteries bringing with them observances of the traditional vows of stability, conversion of manners, and obedience to a part of the world that’s been basically secularized for a long time even though the Norwegian Lutheran Church is the “state church.” In 2009, monks of Munkeby Priory are the first foundation of the great Cistercian house of Cîteaux since the 15th century, and in 2000 the American nuns arrived. Cistercians first came to Norway in the 12th century. This 15 minute video gives a good introduction into the Monkeby and Tautra Cistercians. The Cistercians join the Dominicans and Poor Clares in establishing new contemplative houses in Norway, the North country. The Benedictines have returned to Denmark and Sweden and the Brigittines and Carmelites in Iceland. Hear with favor our prayers, which we humbly offer, O Lord, for the salvation of the soul of Father Louis (Thomas Merton), your servant and Priest, that he, who devoted a faithful ministry to your name, may rejoice in the perpetual company of your Saints. The famous Trappist monk, Thomas Merton (b. 1915) died on this date in 1968. In very many ways Merton was a consummate human being: loved pleasure and engaged his freedom only to transform pleasure and his version of freedom with his embrace a life of prayer and silence as a Strict Observance Cistercian (a Trappist monk) in a Kentucky abbey. 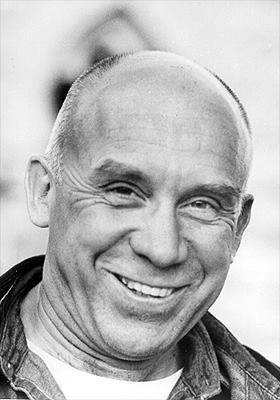 In the monastery Thomas Merton was known as Father M. Louis, a name I still prefer to use because of his commitment to the monastic life. At the command of his abbot, Merton wrote of his conversion in his 1949 best seller, The Seven Storey Mountain, introducing millions of people to the monastic life. No other book since this one has had such a critical impact on Catholics. His conversion story was only one of many books and essays published by Merton and even in death Merton continues to publish due to the finding of new materials or the repackaging of thought into new books. The irony of Merton’s life as a monk is that he died in Asia conferencing with an international and interfaith group of monks and nuns. His body was brought home in a steel casket on a military transport. In his lifetime Merton was a voice of reason, a voice of sanity, a voice speaking the Word of God. As typical of public thinkers he became a voice and an influence for a variety of types of people, from artists, intellectuals, religious types, peace and nonviolence promoters and the like. 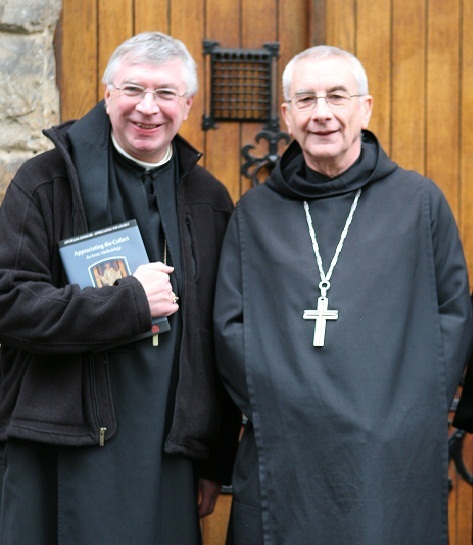 The Benedictine life is simply living the Gospel without fanfare…. The mainspring of everything in Saint Benedict is the love of Christ in Himself, in the poor, in the monastic community, in the individual brethren…. This is the key to the monastic life and spirit. A life totally cut of is good for a few, like the Carthusians, but for Benedictines and the Cistercians (a reformed group of Benedictines) who form a school of prayer and love in Christ, nothing is out-of-bounds. 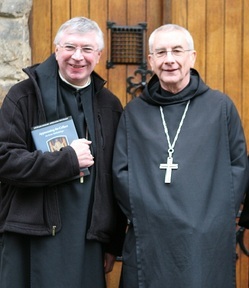 Merton, indeed, opened the doors to a new manner of living the vitally important monastic life today. He sought to be a saint, that is, be yourself, is the vocation that all of us ought to consider doing with seriousness. The Pope echoes this notion, so does Communion and Liberation. Great minds think alike. Watch Father Jim Martin’s video presentation on Thomas Merton. Thomas Merton’s work continues with the initiative of The Merton Institute for Contemplative Living.